Simple but user-friendly RSS reader. Resizeable vertically so you can view between 3 and 20 news items at a time. Customize how often the feeds are refreshed. Choose between large and small fonts in main list. Great work as always Matt! That's slick. Nice job Matt. 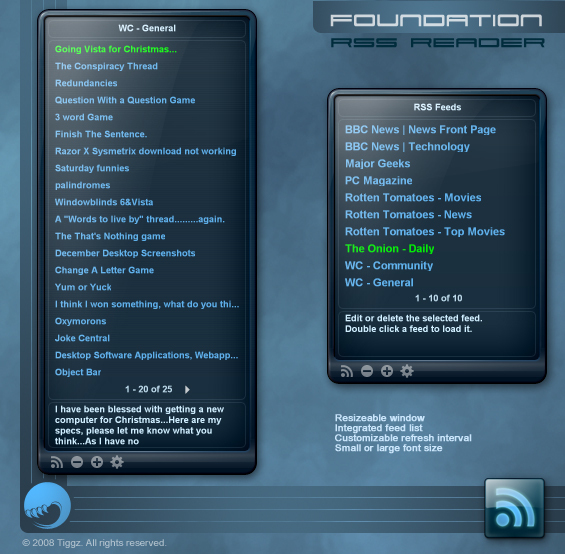 Really fantastic rss reader, probably the BEST widget I've ever seen for functionality usability and design. Great work as always Tiggz. I can't add any new feeds to this for some reason. Any ideas? Outstanding idea for a widget. But, even the large font size is too small for high resolution displays (1600 x 1050). Keeps telling me not a valid package - but it's in system tray but no right click menu..?